Dr. David Fitzpatrick, Max Planck Florida Institute's new CEO and director of the Department of Cortical Circuit Function and Dr. Peter Gruss, president of Germany's Max Planck Society. The Max Planck Florida Institute has recruited David Fitzpatrick from Duke University to be the CEO of its Jupiter campus. The scientist, who will also be the director of the nonprofit’s Department of Cortical Circuit Function, starts in early January. Fitzpatrick is the founder and director of the Duke Institute for Brain Sciences, and a professor of neurobiology at its school of medicine. He has been a senior editor of the Journal of Neuroscience. His wife, Martha McLean Bolton, a research assistant professor in the neurology division of Duke’s Department of Pediatrics, will join him at Max Planck as a research group leader. 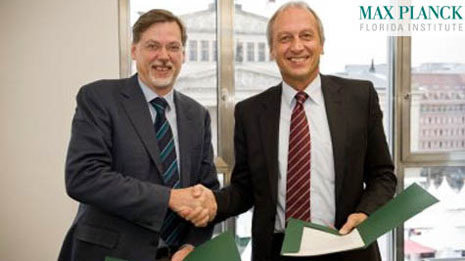 “Recruiting such a keen scientific mind with the credentials and the caliber of Dr. Fitzpatrick’s greatly advances the research mission of the Max Planck Florida Institute,” said Dr. Peter Gruss, president of Germany-based Max Planck Society, in a press release. Florida and Palm Beach County started investing a combined $181 million into Max Planck in 2008 to support the biotechnology industry. Of that, $60 million is slated for a 100,000-square-foot research center that is expected to open in 2012. Max Planck scientists are working in a lab building at Florida Atlantic University’s Jupiter campus. In addition to leading Max Planck Florida as it moves into its new building and recruits more scientists, Fitzpatrick will continue his research into how cortical circuits in the brain mediate visual perception.